Yesterday we enjoyed the respite of our warm beds and blankets a little longer. We hung out in our pajamas till mid-afternoon. And, we feasted on a big, homemade breakfast about the time we’d normally be arriving home from church. We sipped our coffee. We chewed, instead of inhaled, our food. We spent time together in the same room for more than a few brief minutes or the length of one television show. It was nice. It was peaceful. And, it was savored. Once the plates were cleared and bellies were full, Todd and I stood in the kitchen, held each other tightly and wept. Ten years have passed since we’ve shared a similar embrace and those same painful tears. “We should probably use today to prepare for what may come. We know from experience, if we get bad news, we’ll have to make some decisions quickly and things will move at a rapid pace. So, while we still have a bit of control, let’s get ourselves ready just in case”. Todd agreed and suggested that we fill the boys in as well. Until that point we had been relatively quiet about the whole thing. Neither of us want to cause alarm, undue concern, or attention to ourselves. We know there’s a very real possibility of what may come though. My mom shared yesterday morning, with the ladies in the Sunday School class she and I attend, what she knew of the situation. We knew with making the information public we would likely receive more phone calls, texts or visitors than normal, and we felt the boys should know why. There is no easy or perfect way to tell your children this kind of news. I thought I would be able to get the words out of my mouth with confidence and assurance. Instead they clumsily tumbled out and the tears started up again. We did our best to explain and reassure. I may have cancer again. We talked about CT scans and scopes, what may come, and what may not. The boys were both quite young the first time I had cancer. 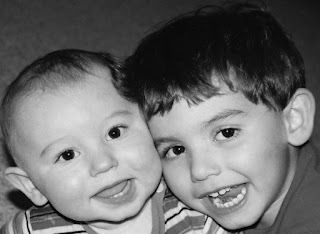 My youngest, Joseph, only 9 months old then, and my oldest, Jack, just three. I remember holding Joe in my arms and the ache in my heart as I wondered if we would ever be given the opportunity to truly know one another. And yet now, with ten year old hands hugging my neck, he held me. The moment didn’t pass without love from Jack as well. I am surely blessed with some wonderful boys. I love them and they love me. It’s good to be loved. The rest of our day was filled tending to chores and duties and later time together with a splurge on an amazing ice cream cake! This week, today in fact, is my 10 year "cancerversary". So, we celebrated. Ten years of cancer freedom. Ten years of time together. Ten years of memories made. Ten years of loving deeply and being loved. Then, as the day drew to a close, two precious boys climbed in bed with us. None of us able to sleep. So, we held each other tightly and we prayerfully surrendered to the Lord our lives and this circumstance we’re facing. We know our world may change, but we also know we serve a God who does not. No matter what, God. Is. Good. In a changing world, we trust our unchanging Lord. He is our rock. Our hope. Our joy. Our salvation. I pray He is yours as well. Our family would so appreciate your prayers as we prepare our hearts and minds for news to come. We have not received a cancer diagnosis yet, and of course, hope and pray we do not. We trust in God’s goodness and perfect plans for our lives though. So for now, we hold on tightly and we wait….